If you are like me, during the summer months you only have one thing on your mind...GRILLING! From May to September we have an entirely new genre of food at our fingertips. For months we have been frying, sautéing , roasting, etc., and now, as if a brief respite from Heaven, God says "Let man cook over open flame for it is good!" Okay, so maybe God didn't say that, but I am pretty sure if you asked Him, He would agree. That is why it grieves me to think that so many people are limiting their grilling repertoire to hamburgers and hot dogs because they are intimidated by the process! You don't have to be! Take ribs for example. Many of you are saying "There is NO WAY I would attempt ribs!" 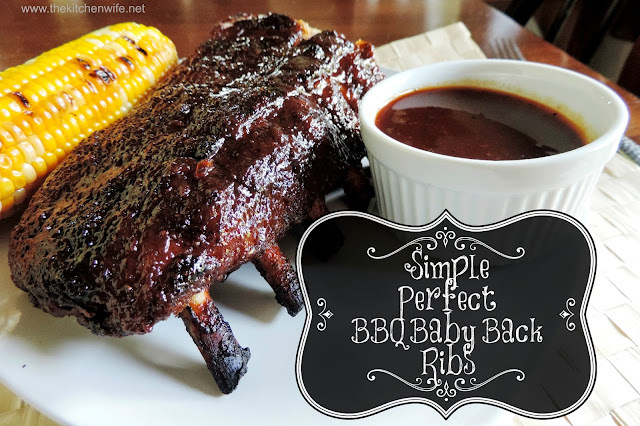 Well, I am going to show you a foolproof way to get perfect, fall off the bone, ribs every time, that are sure to WOW your family! If you have ever tried to grill BBQ ribs, you know there are several ways to go about it. Some people boil them first, some smoke them, some just throw them right on the grill and go for the gusto. The thing is, boiling can make your house smell like a tannery, not everyone has a smoker, and pork can get overdone and dried out very quickly. So how do I remedy this you ask? Simple, I bake them off in the oven first, THEN I finish them on the grill. This gets that succulent, fall of the bone meat we love, with the sweet and tangy caramelized crust we long for! It is the best of both words and ANYONE can pull this off in ANY kitchen! Then, in a mixing bowl, combine the BBQ rub and brown sugar and mix it well. This BBQ rub is one I purchased at a specialty spice store, but you can purchase them at any grocery or even make one of your own using the MANY recipes found on the web. Pat the ribs dry and season them liberally, on both sides with salt and pepper. When you are finished, it should look like this. Cover with foil and place in a 350 degree oven for 1 hour. After one hour, drop the oven temp to 250 degrees for another hour and 45 minutes. When you remove them from the oven it will look something like this. At this point the ribs are cooked through and can be eaten. HOWEVER, we are about to kick things up a notch! Place the ribs top-side down for 5 minutes with the lid down on a medium-high grill. After 5 minutes flip the ribs over and baste with the BBQ sauce. Close them lid and cook for another 10 minutes, basting every couple of minutes. After 10 minutes of basting it will look like this! Let the ribs rest for about 10 minutes. It looks like they have been in a smoker for hours, and even tastes like it! Only you will know just how simple this really was. Don't have a grill? No worries, just pull them out of the oven, baste with sauce, and throw under the broiler for a few minutes to allow the sauce to caramelize. You will get the same affect! These ribs are supper filling so you won't need to serve them with much. Some grilled sweet, summer corn with extra BBQ sauce on the side and you are golden! Don't let the thought of grilling big meats intimidate you anymore! Get out there, fire up that grill, and get cookin'! Pat the ribs dry and season liberally, on both sides, with salt and pepper. In a bowl combine BBQ rub and brown sugar. Sprinkle 3/4 of the rub on the top of the ribs. Rub into the meat. Flip the ribs over and sprinkle the remainder of the rub on the underside. Place the rack of ribs on a foil lined baking sheet and cover with foil. Place in a 350 degree oven and bake for 1 hour. After one hour, lower the temperature to 250 and bake for another hour and 45 minutes. After 1 hour and 45 minutes, remove from oven and place face down on a medium-high grill for 5 minutes. After 5 minutes flip and baste with BBQ sauce. Let cook for 10 minutes, basting every few minutes. Remove from grill, let rest for 10 minutes, and serve.